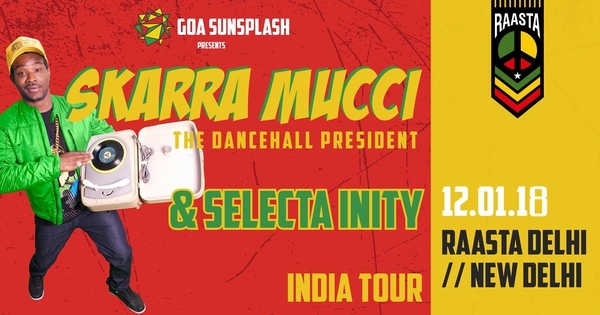 Jan. 12, 2018 at 9 p.m. to Jan. 13, 2018 at 1:30 a.m.
Goa Sunsplash proudly presents Skarra Mucci's debut India Tour. One of the headliners of Goa Sunsplash 2018, Skarra Mucci's second India show will be held at Raasta Green Park, Delhi alongside support from Selecta Inity. Skarra Mucci is a Jamaican born artist, known as one of the most versatile singers of his generation. With constant changes between Soul, Gospel, Reggae, Dancehall, Rap and R and B his talent is incomparable. His endless lyrical flow and creativity make his style unique and which earned him the title “lyrics millionaire“. Skarra Mucci has released 6 albums since his debut solo album Rise and Shine (2007). In 2012 he released Return of the Raggamuffin which went to number 1 across Europe above Sean Paul and many more giants in the business. His latest release “Greater Than Great” was one of the best selling album in 2014 and was awarded the best dancehall album in France. Goa Sunsplash is an international reggae festival happening on 13th and 14th January 2018 at Riva Beach Resort, Mandrem. It is South Asia's largest celebration of reggae culture with 3 music spaces catering to all styles of reggae music from dub to dancehall. Guests will enjoy a live stage, a dancehall arena and a roots reggae area powered by the custom made 10,000 Lions Sound System. Food from some of Goa's finest eateries will be available and the flea market will be stocked with crafts from around the world. Artists from over 25 countries have played at previous editions of Sunsplash and guests from over 50 countries have attended the festival before. Previous headliners include General Levy, Zion Train, Brother Culture, Naaman, Cali P and Manudigital.